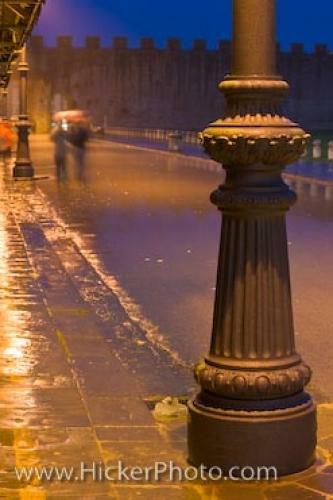 A street lamp illuminates the details of its own decorative post as well as the surrounding street scene during a heavy rainfall at the Piazza del Duomo in Pisa, Tuscany, Italy, Europe. Not even the cold and rainy season can dampen the beauty of the Piazza del Duomo in Pisa, Tuscany, Italy, Italy, Europe, as illustrated by this image of a decorative lamp post lighting the way for a couple sharing an umbrella under the rainfall as they stroll the wet street. The image of the fine details at the base of this illuminating lamp post at Piazza del Duomo complements the Roman architectural influences found in Pisa, which is located in the western region of Tuscany, Italy. Autumn is Tuscany's wettest season, with rainfalls pouring heaviest in October and November, often lasting days at a time. in Piazza del Duomo, Pisa, Tuscany, Italy. ... Its name translates to Cathedral Square. The walled-in plaza is atypical of paved Italian piazzas, consisting of grassy fields and four famous historical architectural landmarks dating back to the 10th Century. Most notable of this piazza's architectural landmarks is Pisa's eight-storey Campanile, famously and affectionately referred to as "The Leaning Tower of Pisa," which was constructed in 1173 in Campo dei Miracoli, the "Field of Miracles." Construction was finished in 1350 with the hanging of the building's seven bells. Other famous historical buildings popular with tourists are The Cathedral of Pisa (built in 1064), The Baptistery (built in 1152) featuring a great marble pulpit carved with scenes from the life of Christ, the walled-in cemetery Campo Santos (built in 1278) which contains earth from the Holy Land and magnificent Roman sarcophagi. Pisa's Piazza del Duomo was named as a World Heritage Site in 1987 by The United Nations Educational, Scientific and Cultural Organization (UNESCO) in recognition of its standing in worldwide cultural heritage and importance. Base of a lamp post in Piazza del Duomo (Campo dei Miracoli) during heavy rainfall, UNESCO World Heritage Site, City of Pisa, Province of Pisa, Region of Tuscany, Italy, Europe. I photographed this photo with the digital SLR camera model Canon EOS-1Ds Mark III, aperture of f/8.0, exposure time of 5/1 sec. on ISO 50, as always I used a original Canon Lens, the focus lenght for this picture was 70mm.